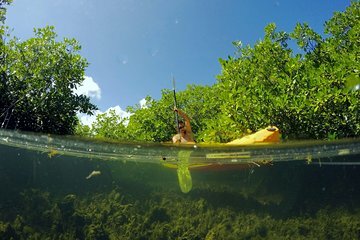 Paddle through the mangrove forests of Beef Island on a stand-up paddleboard or kayak on a 1.5-hour excursion from Road Town. Known as the 'nurseries of the sea', these mangrove forests are a safe haven for juvenile marine life just learning to fend for themselves. Travel at a leisurely pace with your small group and local adventure guide, keeping an eye out for barracuda, baby sharks, stingrays and turtles. Use of all equipment is provided. Meet your guide and small group at a secret rendezvous point on Beef Island; you'll receive detailed directions ahead of time. Listen to your guide as they give a short safety talk and orientation to the area, then get fitted with your kayaking or stand-up paddleboard gear. Even for a first-time paddler, either sport takes less than 10 minutes to learn, especially under the guidance of your experienced instructors. Take some practice laps and then head out for the lagoon. Paddle over to edge of the lagoon that is protected from the wind. As you move, look into the clear, shallow water for fish and other marine life. Rest assured that your guides do not advocate feeding marine life; they leave the fragile ecosystem to its own devices. 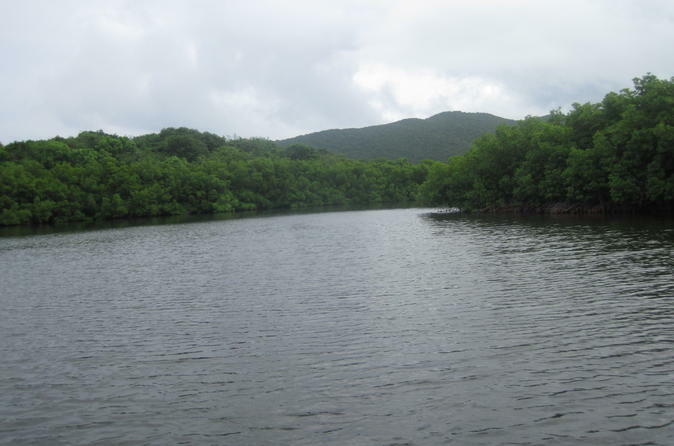 Continue into a shallow area full of baby mangroves, a nursery for unusual creatures such as the caseopea andromeda and others. Look skyward to see sea birds such as ospreys, mangrove cuckoos and pelicans. Underwater, look for turtles, stingrays, barracuda and tropical fish. Midway through the tour, go ashore on a tiny coral atoll, a representative example of how the natural forces create these lagoons, marine forests and islands. Your guide can fill you in on the history of the BVI, from pirates to mega yachts. End up back at your starting point after 1.5 to 2 hours of paddling. It was unique experience. Saw upside down jelly fish. Didn’t get to see other baby creatures as described but still would recommend. Started from a stunningly beautiful private beach to start kayaking. Went through mangrove bush to get to the nursery of jelly fish. It was a good excursion for family. My 11 year old daughter had fun as well. Transportation is not included. $12 per person one way. We had family of 5 so ended up paying $120 just for the ride. Had a great time. Trip was relaxing. We basically were all by ourselves. Our tour was our family of 3 and another family of 5. Definitely not full of tourists. Alex was fantastic. He was knowledgeable and patient. Scenery was beautiful. My 19 year old and 13 year daughters said it was their favorite port adventure of our cruise. The weather wasn't the best that day, but Alex did a great job managing our trip around the rain. Would definitely recommend and do it again.